The knee helps support body weight and plays a critical role in many movements. While there are many types of knee pain, osteoarthritis (OA) is the most common, especially for those 65 and older. A progressive joint disease, OA causes breakdown of cartilage and fluid lubricating the joints in the synovial cavity. This degradation causes friction between the bones as they rub against each other during movement. Symptoms of OA include pain when moving the knee, joint soreness, and joint stiffness. AQ Therapeutics’ Joint Relief Solution (JXN) helps fight the degenerative process of OA with the first highly formulated hyaluronic acid with patented growth factor technology by regulating cellular activity. 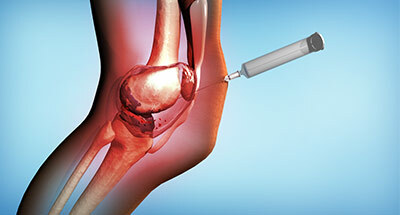 High molecular weight hyaluronic acid and GFs are injected into the knee. The HA then binds to nerve cells reducing their sensitivity and therefore reducing pain. AQ growth factors aid in releasing anti-inflammatory cytokines which promote healing and proliferation of chondrocytes and synoviocytes. AQ JXN is a non-surgical therapy that helps provide pain relief and improve knee function.